Pictured at the landslide from left to right are senior engineers Chris Stitt and Angus Wilson. The landslide saw 9,000 tons of soil and rock crash 2,500ft onto the road outside Kinloch Hourn completely destroying it in the process. They flew cable over the safety exclusion zone around the landslide to the base of the Quoich Dam, where they were able to connect the new cable to the existing network. An Openreach team then walked three miles in torrential rain and hail to the nearest radio sub-station to make sure all six lines had dial tone. Although the landslide occurred on November 12, a single phone fault was only reported this week. 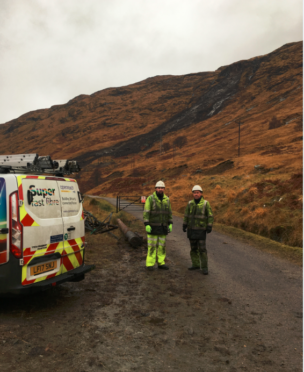 Fraser MacDougall, Openreach operations manager for Highlands and Islands, said: “As there is no mobile reception at Kinloch Hourn, the radio link is the main means of communication and summoning help in emergencies. “It was important to get it restored so that residents have access to services while clean up and stabilisation works are completed.